Where do I even begin with this post?! Well, let's just jump right into the goodness. This tassel necklace is going to be on repeat. Just a warning for you. Coincidentally, I had been lusting over a tassel necklace that Gina has, and was a bit sad because I put myself on this self inflicted shopping ban. Then, Stacy from CS Gems contacted me about collaborating with them and styling one of their tassel necklaces. Needless to say, I jumped at the offer immediately and was ridiculously grateful! How gorgeous is it? Vintage simplicity at its finest. If you've never checked out their goodies, I highly suggest you do - their new site just launched here. And while you're at it, follow them on Instagram here. I truly don't follow many shops on IG because they can be a bit too spammy and catalog-y. I love that GS Gems applies their products to real life on their Instagram page, and they're genuinely nice and engaging on top of that! The fact that they have great products is really just an added bonus. I am very thrilled to be collaborating with them. I thought the necklace would pair perfectly with this fringe poncho. The weather a couple of weekends ago was gorgeous - in the 60's! I was very comfortable in this knit number. Yes, it's a bit flowy, which is why I wanted to wear my skinniest leggings with it. I was THISCLOSE to wearing wedge sandals instead of these booties, but I couldn't bring myself to tease my feet into thinking it was spring just yet. I originally paired this with peep toe booties and my wine colored bag with a low pony. But it was SOO windy the day I took these photos, that it was difficult to get more than one good shot of the poncho. For take two, I decided to get my hair out of my face and go with full on black booties and my turquoise bag. Excited to wear both the poncho and the tassel necklace through all seasons! Shop CS Gems and use code "CARYLEE15" for 15% off! This code does not expire, so shop to your heart's content! NOTE: CS Gems gifted me this necklace, but all opinions expressed in this post are my own. PS Enter to win the perfect scarf HERE and a $600 Visa Gift Card HERE!! So jealous of your warm weather! I can understand why that necklace will be on repeat, it is fab! Love both looks with the ponco!! LOVE this entire look, that poncho is amazing!! 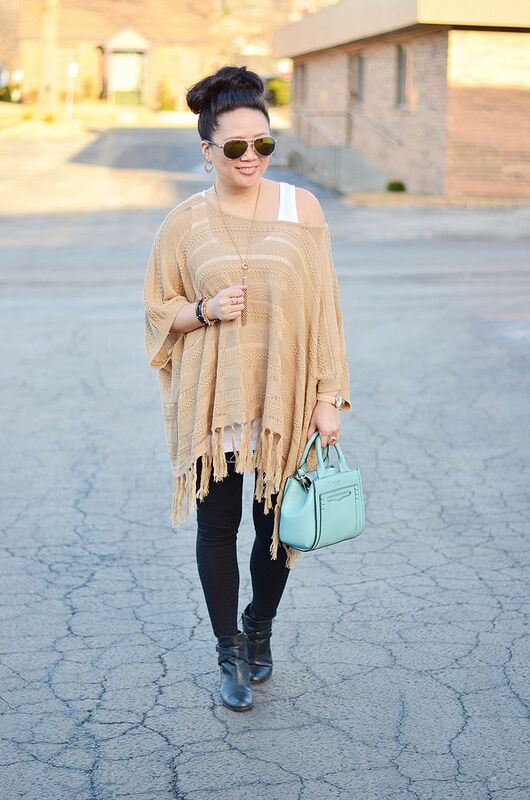 This poncho is so cute and you paired it perfectly with the tassel necklace and cute bag. Such a great fun look! Love this poncho! Yay! You got your gold tassel! And I agree- CSgems has a nice feed with people actually wearing the products, so it feels more like a regular fashion account. That beige poncho is so cool! Both ways you styled it turned out great, and I like the balance that the leggings bring to the whole look. I adore this poncho, you wear it really, really well! The tassel necklace is gorgeous, looks great with the look! I love that poncho! I am still looking for a good one and found some at Forever 21 yesterday but blogging has made me picky and I didn't like the ones I tried on..sad! Jealous! You can wear peep toe shoes and I've been in L.L. Bean duck boots for the last few months! You look so fantastic in this sweater, either booties or peep toes work with this outfit. Love the tassel necklace. Looks like I'm going shopping soon! Nope, but I made a disclaimer in my rules that I may feature some items from a few blog sponsors here and there, but do not plan on including these in my official remix item count. I adore this look. I'm so planing on getting a poncho like your for springs. I love the little turquoise bag! What a great touch. Totally need to pick up a tassel necklace asap! I can tell I would want to wear it nonstop! Such a fabulous outfit--I love all this tassel and you are doubling up--perfection!! Love your necklace! It's so on trend right now. I have to check out the shop. Enjoy the rest of your week! Love the colour combination of mint and camel! Beautiful look! Just found your blog through a comment on Bri's and I am loving sifting through all of your outfit posts! I love that little KS bag in this post. It's so adorable. I just saw a mini-Rebecca Minkoff in a similar color and shape on the Nordstrom sale table and am still thinking about it. So cute, lady! !